A Tight Squeeze! The Hanoi to Ho Chi Minh City train filling the gap. Train track running through the narrow Train Street in Hanoi. 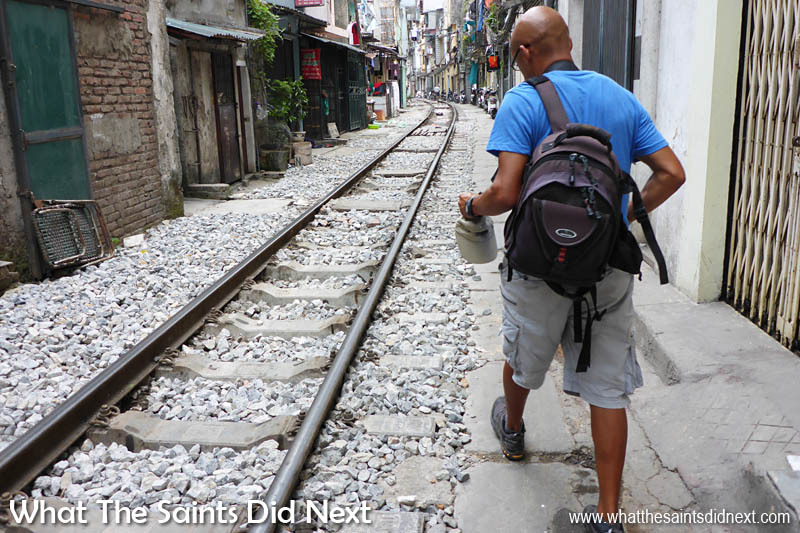 The train track running through the narrow Train Street in Hanoi was something we just HAD to experience for ourselves. As photographers, every now and again we capture an image where the process behind the ‘click’ is almost more interesting than the photo itself – this is what ‘Right Click’ is all about, revealing the story behind the picture. We also have a video to go with this post. Does the train come through your town? 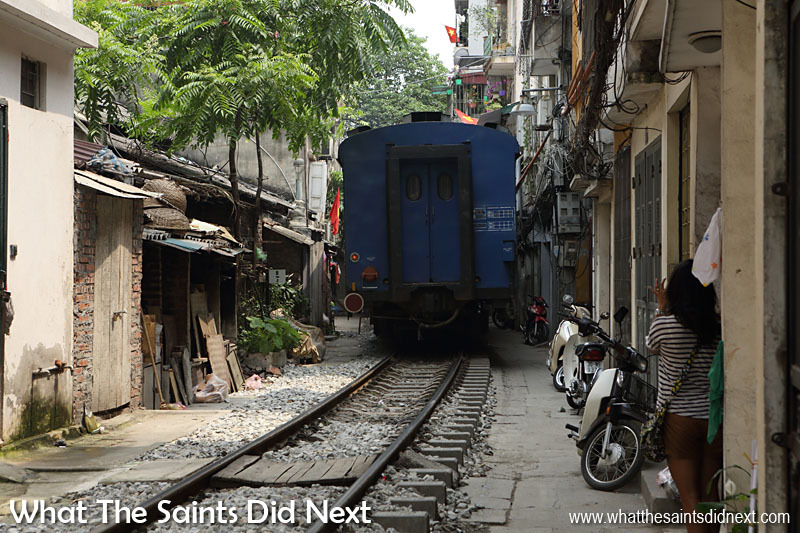 When someone says a train comes through their town, that’s not unusual in itself, but residents in the Old Quarter of Hanoi, Vietnam, could easily get away with boasting that the train runs right through their living room! 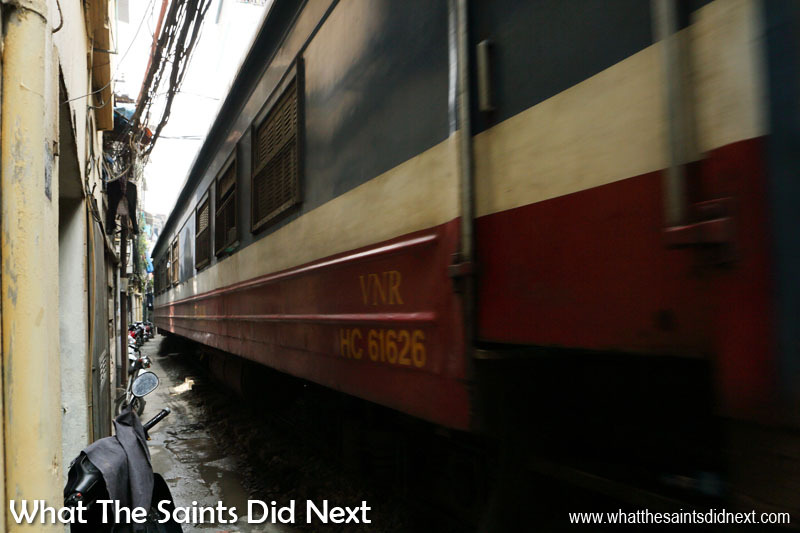 The relentless Hanoi moped traffic will give way to the train, but then continues immediately once it’s passed. Mopeds must be parked carefully, no room for getting it wrong! Train track running through the narrow Train Street in Hanoi. 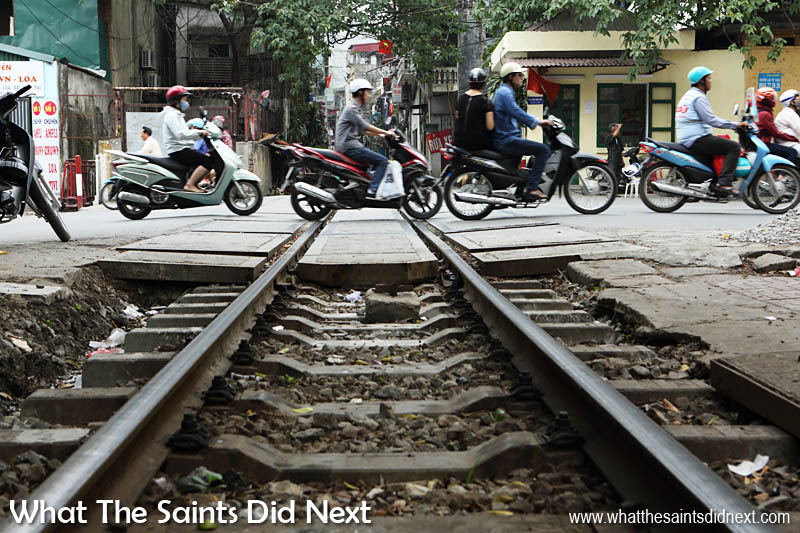 A friend had suggested the train tracks through Vietnam’s capital city where trains brush up against the houses could make a dramatic photograph. It took three attempts and it wasn’t until the day before leaving the country that we finally got the picture. Hanoi (or Hà Nội) is an extremely busy city, especially in the Old Quarter. Everyone seems to be out on the street, either on foot or on mopeds. The buildings look as though they were constructed as normal then squeezed together to save space, leaving the tall, skinny architecture that is such a feature of Vietnam. Sharon called them, supermodel buildings! 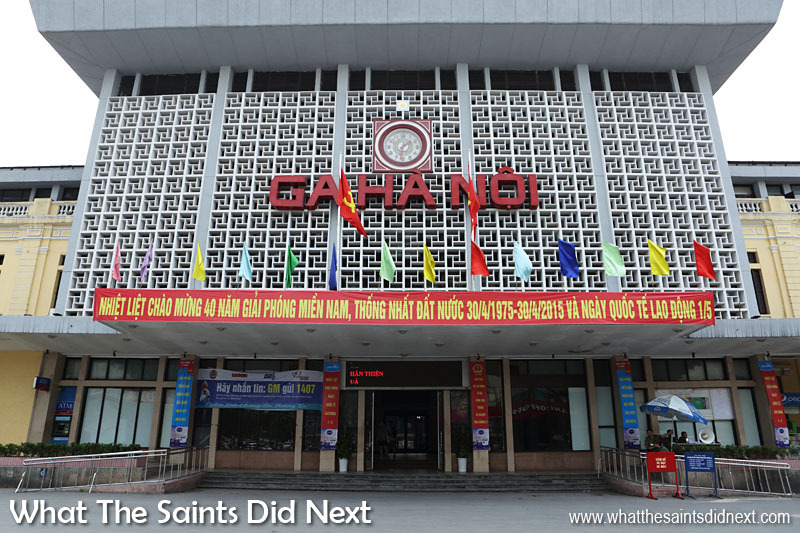 The Ga Hà Nội train station in Hanoi, Vietnam. 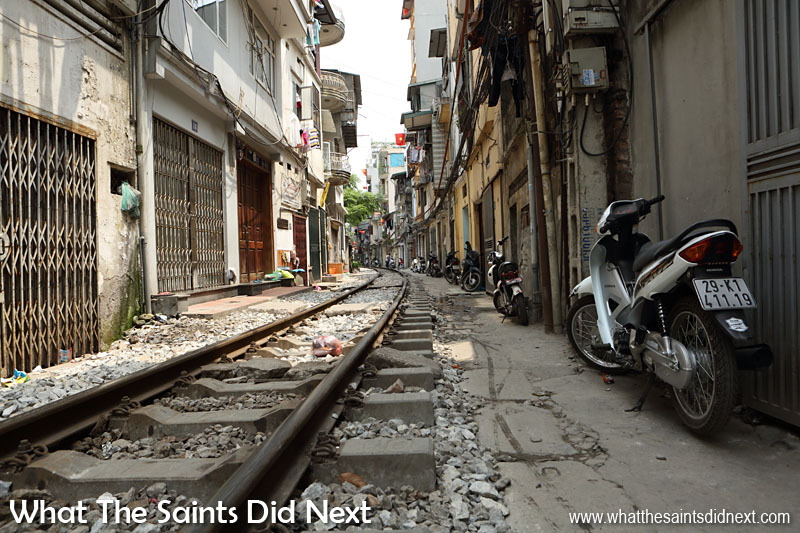 This picture shows quite clearly how little room there is on either side of the train track running through Hanoi. Even with all that compactness, the sight of the railway line snaking through the narrow gap between the houses was incredible. We were just off one side of Khâm Thiên street. 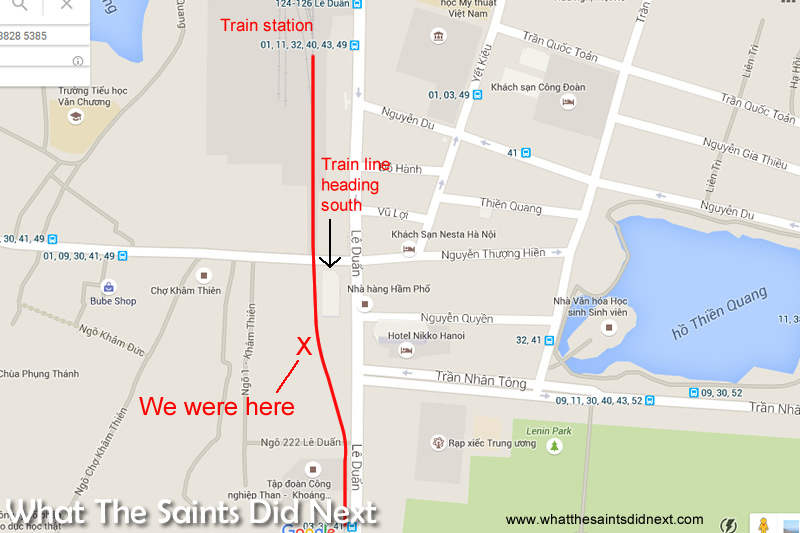 The Ga Hà Nội train station was off the other side on Lê Duẩn street. The train we were hoping to capture was the 13:07 southbound toward Ho Chi Minh City, but our lack of language skills and trouble interpreting the station timetable had let us down before. We chose to shoot from doorway recesses which offered a little cover. Mopeds parked outside the houses looked impossibly close to the track, as did the flags and power cables dangling overhead. A little after 1pm in the afternoon the haunting sound of the train horn and a distant rumble told us we were in the right place and anticipation levels went up a notch. Sharon took up her position a little further down the track from me; we both watched with growing excitement as a big, square looking, blue locomotive appeared on the tracks. As the train got closer I noticed two things: One, the space I was in started to feel uncomfortably smaller by the second, and two, the train was travelling a lot faster than I had expected. I had mistakenly assumed the proximity of the houses meant it would crawl through, but no! With the camera on rapid burst I began firing away as the machine filled the gap between the houses and then loomed up above me. 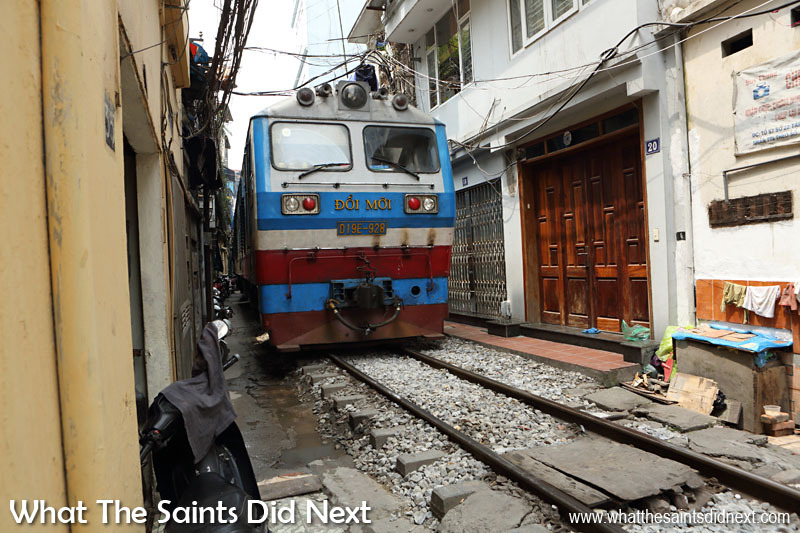 It was a heart thumping moment as the train roared past, the hot breeze from the engine’s slipstream in my face and then the heavy, clunky rhythm as the carriages were dragged through the narrow alleyway, the ground vibrating under me. Gosh, it felt so close; just lifting the camera to my eye felt as though I was asking to be hit. The train through Hanoi, Vietnam. Up close as the carriages whiz by. Train track running through the narrow Train Street in Hanoi. The back of the train as it rumbles away heading for Ho Chi Minh. Train track running through the narrow Train Street in Hanoi. It seemed to take a long time for the train to pass, but then suddenly that last carriage rolled by and I was looking at the back of the train as it fast disappeared around the corner. We both emerged from our hiding places, laughing at the experience and the fright the train gave us. What a rush! The route of the train and our position along the track. (GoogleMaps). Train track running through the narrow Train Street in Hanoi. Fascinating. Gives a great insight to the research & care that can be needed to deliver the wonderful shots you’ve been sharing with us. Thanks Roger, really appreciate your comment. At the station they let us look at the timetable book which actually had a different set of times (the train only came through twice a day) and it was just by chance we spotted a handwritten notice on a whiteboard type noticeboard, in another part of the station that had time of next departing train – otherwise we would have missed it again! The information lady in the station didn’t speak English and was a bit flustered with a group of travellers who were in a bit of a panic. But priceless memories now and so glad we saw this. Cheers.